Chief Keef Out of Jail: Did He Light Up Soon After? 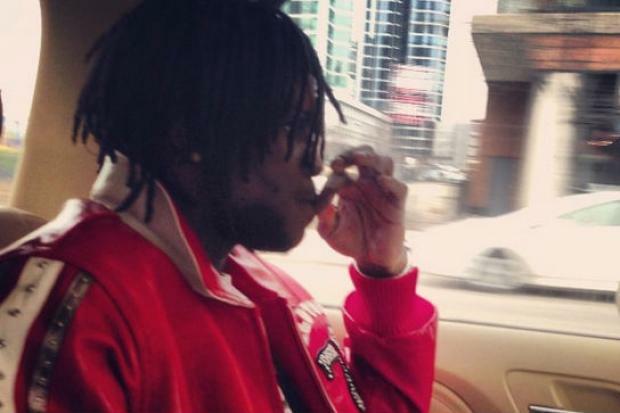 CHICAGO — Did Chief Keef go back to his old ways of smoking "dope all day, all night" on his way home from jail? Not long after the teen rapper finished his 60-day juvenile jail sentence for violating probation, an Instagram photo was posted online that appears to show him holding his fingers to lips as if he was smoking a joint. Chief Keef, who has said he "hates being sober" and raps about smoking "dope all day, all night," got out of jail Thursday afternoon after being locked up for violating his probation on an earlier gun possession conviction. Chief Keef, whose real name is Keith Cozart, quickly tweeted upon his release. "Feels great to be out! Thanks for all the luv y'all showed a n---- #300," the 17-year-old rapper tweeted at 1:16 p.m. Wearing a red jacket and sporting a scruffy beard, he was handed his young daughter before he got into a waiting car driven by his uncle. Not long after, the Instagram photo appeared with the 17-year-old rapper wearing the same jacket and sporting the same beard. Now that he's served his time, he's not longer to subject to the prior terms of his probation, his attorney said. A Cook County Juvenile Court judge had ordered him held after the South Side rapper appeared in a Pitchfork.com video holding a rifle at a New York gun range. Prosecutors said the rapper violated his probation from the gun charge he was hit with after pointing a gun at Chicago police officers in 2011. Keef’s attorney Dennis Berkson said that during the hearing, a report on the rapper indicated satisfactory behavior while the teen was incarcerated in the detention center. Prosecutors argued that Keef’s overall behavior during probation was not satisfactory but the judge released the teen. Berkson said the case is now closed and that Keef is no longer under any court oversight. Keef's new freedom coincides with the release of his newest music video, "Now it's Over." The Interscope Records rapper is poised to collect $6 million from the record label during the next three years if his debut album "Finally Rich" is a hit. The majority of that dough he can't spend until he turns 18 in August, according to the contract. He also signed a deal to establish Chief Keef's record label, Glory Boys Entertainment. The Englewood rapper was noticed for his single and music video, "I Don't Like", which he filmed while under house arrest. The video helped land him his deal with Interscope, the label that also lists artists like 50 Cent, will.i.am., and Lady Gaga in its repertoire. After he was sent to jail, some fans took to social media to weigh in and proclaim "Free Sosa," and "Free Chief Keef" across the Twitterverse. The rallying cry was also printed on T-shirts. Sosa is one of the rapper's nicknames. His grandma said she couldn't wait for Chief Keef to get out. Carter said she's not worried about her grandson getting into legal trouble after he's released, rather, she's more concerned about all the ladies after the popular musician.